Always the Contractors choice for cost efficiency, these units provide the power, convenience, dependability, and time saving features you have come to expect from all M.D Manufacturing units since 1961. The M85 is an ideal unit for homes under 8,000 ft2 / 743m2 Its high water lift works well with today's versatile, air-driven powerbrushes to develop maximum cleaning in all areas of your home. 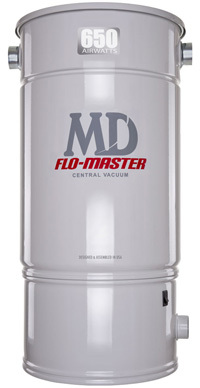 Flo-Master M85 gives you power, long lasting dependability and low maintenance. Central Vac and MD Manufacturing, "a perfect combination".for a central vacuum system.